Are you looking for quality screen printing or embroidery? You found the friendliest and most knowledgeable company in Southwest Florida! For over 40 years, Screenprinting and Design have built a reputation as a quality custom and contract screen printers. And in that time, we have accumulated the experience and expertise that you are looking for. With the most up-to-date inks and materials to keep your design looking great for years to come. 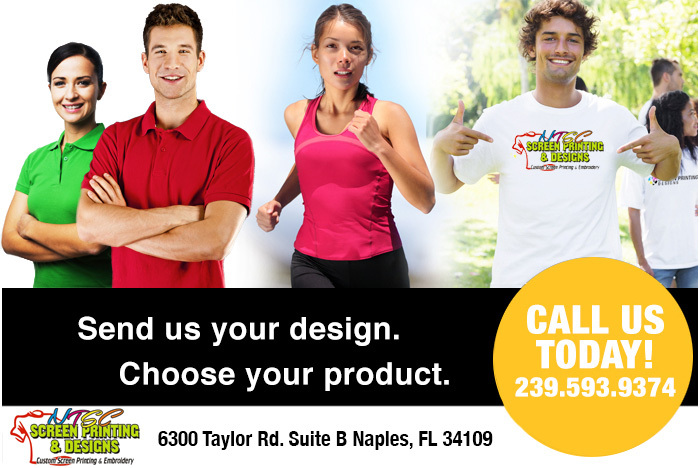 At Screenprinting and Design Our production is done right on site from start to finish in our Naples facility. Screenprinting and Design is a family owned business that will treat you like one of the family. With our in-house graphic artist, we can turn your ideas into a reality. We can design a logo for you or you can email one to us. Tell us how many and when you need them and THAT'S IT…… How easy was that??? We take the hassle out and the fun back in. It is so exciting to see your custom design on a t shirt or jacket! Our attention to service and quality has made us an industry leader. At Screenprinting and Design the customer always comes first, and we constantly strive to exceed your expectations! With our wide range of products and services, you're sure to find exactly what you're looking for.